There is kindness in it. The Roanoke have caused us harm. forced us to live in fear. The year is 1587. A group of 115 people arrives at Roanoke Island to establish a colony on Chesapeake Bay. They travel long months to join the first group of settlers, but when they finally arrive on July 22, 1587, they find the settlement deserted, buildings burned to the ground, and nothing else but a single skeleton. Despite their doubts and confusion, they stay to establish a new colony and re-establish relations with the Croatoans and local tribes. They later become known as the Lost Colony. 115 people disappearing without a trace nor a single clue as to what really happened to them. True story. 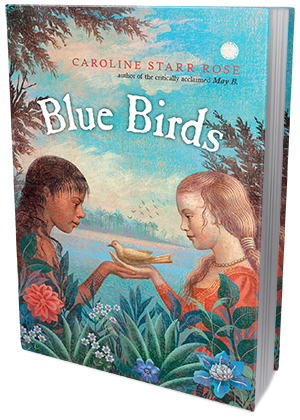 Blue Birds tells the story of Alis, a 12-year-old English girl who arrives at Roanoke with her father and pregnant mother, and Kimi, a young native whose sister was killed by the English men. Through the eyes of these two young and incredibly brave girls, we witness some very important historical events - the first attempts at colonizing the New World, the clash of cultures, the first baptism of a Native American. Most importantly, though, we get to experience the miracle of true friendship and sisterhood - a bond so pure, so beautiful and so powerful, it's stronger than the language barrier, the cultural differences and all the brutal and bloody events that ought to break it. Despite the many differences and completely different backgrounds, Alis and Kimi are very much alike. They are both curious about the world surrounding them and the people who live in it. They're trusting and open minded, and their hearts - not yet tainted with skepticism, greed and pragmatism of adulthood - are free and willing to embrace another human being, paying no attention to the skin color, religion or cultural and historical background. These two remarkable girls overcome fear and grief to become friends. I loved reading about their secret meetings, their attempts to communicate with one another and their incredible dedication to each other. It was beautiful and moving. And really inspiring. Blue Birds is a novel written in verse and I'm so glad the author chose this form, for it is just perfect for this type of story. It's like an all-consuming tornado of a book, it will sweep you up and you'll be lost to the world. It's a thoroughly compelling and quite powerful historical novel, masterfully blending actual historical events with emotionally engaging fiction. The verse form turns this 400 page long story into a complete page-turner, but one that you won't forget easily after finishing. This is the kind of story I know will stay with me. I am very glad to own a copy and have it on my shelf, I definitely want my daughter to read it and learn from it when she's old enough to pick it up. It's a real gem among middle grade historical novels. When the English first explored the island of Roanoke in 1584, the Native and non-Native interactions were positive. But by the time the colonists arrived in 1587, the English were no longer welcome. Those intervening years included the English burning a Native village because of a missing silver cup. The Roanoke’s growing frustration with English soldiers who’d built a fort on their island and insisted the tribe provide for them. Diseases brought by the English that decimated many of the Native peoples. Finally, escalating mistrust between the Roanoke and English pushed English leader Ralph Lane to plan a pre-emptive attack on the tribe, killing Wingina, the Roanoke chief. When, days later, the English sailed home, they knew there was no chance at reconciliation. So why then did the families wishing to settle in the New World sign up to go to Roanoke? They didn’t. The colonists had been promised land in the Chesapeake Bay area. But throughout the voyage, their leader, Governor John White, fought constantly with ship captain Simon Ferdinando. By the time they arrived in the New World, Ferdinando was done. He left the colonists at Roanoke, refusing to take them any farther. The stage was set for tragedy, and tragic things happened on both sides. I wanted to show this historical truth in Blue Birds, but I also wanted to breathe into the history my own version of hope: Two imaginary girls destined to be enemies choosing friendship instead. Alis about her new surroundings, including the Roanoke girl. Loneliness also draws the two girls together. Each seeking the other out becomes an ethical dilemma for both of them. How can Kimi want to know more about an English girl? with no urge to lower my gaze. but neither are we apart. Her eyes rush to mine. to feel like wood or stone? It is as any person’s would be. Soon both girls make excuses to leave their homes so they might meet each other. The closer their bond grows, the more risks they are willing to take. While the adults around them rage, these children find a common ground. While Blue Birds is rooted in fact, I’ve used my imagination to fill in the blanks. I hope readers will finish the book interested in learning more about the Lost Colony and celebrating the gift friendship can be.